John B. Goodenough is Virginia H. Cockrell Centennial Professor of Engineering at the University of Texas, Austin (1986-present). Other institutional affiliations include Oxford University and Massachusetts Institute of Technology. His research interests include lithium ion batteries and ferrimagnetism. July 25, 1922Birth, Jena (Germany). 1943Obtained AB, Yale University, New Haven (Conn.). 1951Obtained MS, University of Chicago, Chicago (Ill.). 1951 – 1952Research Engineer, Westinghouse Electric Corporation. 1952Obtained PhD in Physics, University of Chicago, Chicago (Ill.). 1952 – 1976Research Physicist and Group Leader, Lincoln Laboratory, Massachusetts Institute of Technology (MIT), Cambridge (Mass.). 1965 – 1968Member, Executive Committee, Division of Solid State Physics, American Physical Society. 1974 – 1976Member, Solid State Science Panel and Committee, National Research Council. 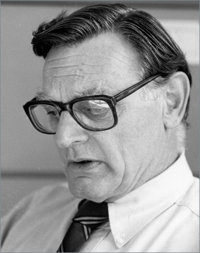 1975 – 1977Member, National Materials Advisory Board. 1976 – 1986Professor of Chemistry and Director, Inorganic Chemistry Laboratory, Oxford University, Oxford (England). 1983Visiting Raman Professor, Indian Institute of Science. 1986 – presentVirginia H. Cockrell Centennial Professor of Engineering, University of Texas, Austin, Austin (Tex.). 1989 – 1990Member, Presidential Commission on Superconductivity. 2011Member, National Medal of Science. PhD advisor at University of Chicago in solid state physics. Virginia H. Cockrell Centennial Professor of Mechanical Engineering and Electrical and Computer Engineering. Research Physicist and Group Leader. Professor of Chemistry and Director, Inorganic Chemistry Laboratory. Member, Executive Committee, Division of Solid State Physics. Member, Solid State Science Panel and Committee. Obtained MS (1951) and PhD in Physics (1952). Interview of John B. Goodenough, March 2001, by Bernadette Bensaude-Vincent and Arne Hessenbruch. Magnetism and the chemical bond.